Disclaimer: The writing and title of this chapter took place some months before. The posting was determined by the bi-weekly schedule I am trying to keep. It is only by coincidence it's posting has fallen on the same week as the incident in Ottowa a couple days before and should not be construed as an attempt on my part for publicity for my story or personal gain. My heart goes out to Corporal Cirillo, the victim of this cowardly attack and his family. Canada, may she ever be our friendly neighbor to the north. God bless her. Duffy looked up from the lawn tractor he was working on, noticing TK, arms folded, leaning on the garage doorways' edge. "Hey, TK ... What's up man!" The blindfolded "man of mystery", crooked smile on his face, jumped into a half crouch, both indexes pointing at the gaijin. "Someone ta' sees ya' ... "
"Not Yurippe bro ... Newbie!" Jack puzzled for a moment as to why a new arrival would want to see him. "American ... Like you. She wants to make speaks at ya'." "Mission accomplished! Gotta go ... Sees ya!" Ordinarily Jack, or anyone else for that matter, would have been amazed to get a "coherent" conversation of any kind out of TK. He didn't even use any rock related catch phrases! But THIS! Another American? HERE? Almost noon, Jack hastily clocked out a few minutes earlier and fast walked to the cafeteria building. "Yup! There he goes," said Hinata. Yuri, Takamatsu, Hinata and Noda watched from the back third floor window across the hall from Safe and Sound. "I'm hoping Duffy didn't start a trend," Yuri stated. "One foreigner, albeit a friendly one, causes enough concern. But two ...?" "Uh ... There goes the neighborhood?" Takamatsu grinned. "Not quite but ... Hey!" "He just waved at us!" 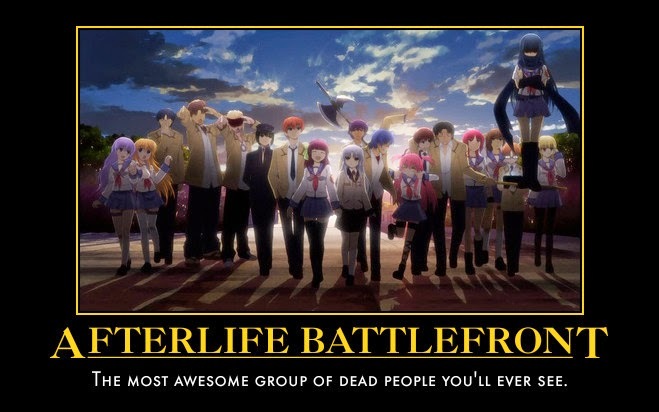 "Oh come on Yurippe," Hinata laughed. "Everyone knows you're up here in 'the nest' all the time keeping an eye on everybody and every thing. Some of us give you a wave from time to time." "If anything," speculated Takamatsu, "the new circumstances might be telling him he's going to be in for more observation." "I think we'll just keep it casual for now ... maybe." "Well," Hinata said. "There's always Shiina." "I wonder how he's going to react when he sees her ..."
"I think," Takamatsu proclaimed, "he's going to be very surprised." "Hey Duffy-san!" Fujimaki called across the Second Entrance Bridge. "Yuri's got all the guys lookin' for ya'. Someone to-"
"I know!" Jack answered hurrying along. "Thanks!" "Yeah, good luck!" Oyama added. "Good luck? Why would anyone wish me that about something like this?" Duffy thought. "New student, needs coordinating ... as she's American ... would probably feel more comfortable if a fellow countryman clued her in. That or maybe the Battlefront doesn't take in foreigners ...or ... I sure could do with news from home." Entering the building, turning into the main dining area, he was brought up short. He could see this was not a student awaiting. All the way across the room, seated at his usual table with her back to him, she was engaged in animated conversation with what seemed the entire female contingent of the SSS with a few of the regulars crowding in as well. Dark hugging skirt, red vest over white longsleeves, topped by a long shock of brilliant red hair. Definitely not student uniform. Teacher ...? "Should have spruced up before running here," he thought. "Well ... Too late for that now ..."
So focused on their conversation, not one of the "mob" noticed his approach. He was at least glad to see she wasn't being treated like the pariah he was on his arrival. He was within only a few paces when the usually observant Yusa, opposite the newcomer, finally noticed him. Several others tracked her gaze, the rest quickly following suit. A hush fell over the gathering as it occured to the recent arrival something new was being added to the conversation. She slowly turned in her seat staring up into the face of the American. Duffy was brought up short a second time as his gaze was met with the greenest pair of eyes he had ever beheld before or since. "My ... God!" He inwardly exclaimed. "She's ..."
She was a beauty at that. Long Nordic face, high cheek bones and forehead, semi-full lips framed by the aforementioned brilliant mane of red. A few freckles under the eyes adding to the charm. The countenance topping a wonderfully statuesque frame. He also noted the look of concern on the lovely face, in spite of the smile. Understandable considering what she must have gone through to have arrived here. In a lame attempt to relieve the tension and break the ice, Jack put on his best faux Bogart. "Pardon me," he intoned. "But could you help a fellow American down on his luck?" The vision rose. Trying to effect a businesslike manner, she extended her hand. "I ... I'm Rachel O'Hara," she stammered slightly. "You must be ... uh ... Mr. Duffy. To her and the onlookers surprise, Jack took her hand firmly in both of his putting on his best smile. A giggle rose through the girl pack as a slight blush appeared on Rachels' face. Though she was informed about him, she didn't expect such friendliness from the start. "Uh ... ," she looked at the crowd then back. "Alright ... Jack! ... And actually ... I'm from Toronto." "Though I think I fell into one heck of a Looney Toon ..."
"I think," speculated Iwasawa giving a knowing gaze to one and all, "these two have some things to go over. Let's go!" "I still got some things I wanna' ask! There's-"
"I still got some things I wanna' ask!" Yui declared. "There's-"
"Later kid," said Hisako as she collared the hyperactive one. "Come on!" With a protesting Yui, the group filed/drifted away from the table leaving the two alone. "I've ... a lot of questions ... and ... well ..."
"As I've a lot to ask you!" Duffy exclaimed. "Please! ... Sit back down ... take a seat!" He strode around the table sitting opposite. "I really don't know where to begin ... neither do you I'll bet ... I-," a frown crossed the mans' face. "Hold on a sec." Rachels' eyes widened as Jack launched off his chair and proceeded to gaze intently about the cafeteria. Her jaw dropped as well in his ducking down and peering under the table. "Just ... WHAT ... are you ..."
"Not trying to be fresh or check you out further or anything," he partly lied. "But ... There's a certain someone I'm always on the lookout for-"
He got up, scanning the large room again. "Little game we play ... Called 'Stalk the Gaijin'." "Ah! ... here we go!" The sound of laughter from many feminine voices had Rachel follow the mans' gaze to the cafeteria entrance. 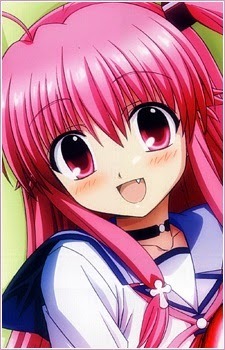 Though not laughing, Shiina at least smiled as she waved, leaving with the rest. "What was THAT ... about?" Rachel inquired turning back as Jack waved back and reseated himself. "And who was THAT girl? I don't remember seeing her before." "She's very good at what she does." "I'm sure they filled you in on the ins and outs of this place ... as far as it goes." "Uh ... Yes. They ... Ms. Nakamura ... and that OTHER ... very strange girl." "Tiny, white hair ... Talks in a sweet monotone and only answers direct questions?" "Yeah. They call her Angel or ... THE ANGEL." About to ask further, she hesitated ... Yes ... the ANGEL. "Eh?" Smiling in response. "I don't do ... 'eh'." "That was corrected in college. Minored in English." "History ... It's what I do. I'm a teacher." "I'm something of a history buff myself, uh ... ," Duffy paused, gazing at her. "Is ... something wrong?." Look of concern. "You're ... you're the first white face I've seen in months (A good looking one at that!). Just ... Can't get over it. Was beginning to think I'd never see that again." Eyes narrowing, her face darkened somewhat. "But lov-a-ble ... ," Duffy replied, leaning forward, folding hands, putting on the CHEESIEST smile he could. "I mean ... I'm tapering off. Why ... I haven't burned a cross in ... Hmmm ... Come to think of it. I havent burned any since I came here." He looked past Rachel and scanned the students about the cafeteria. "Probably be wasted on them." "I think they'd know who to go to if you did." Duffys' friendly sarcasm put her back at ease. "This may be crude and I don't mean to be, but ... considering how one gets here, would it bother you telling me how you uh ... ?" He could instantly see it did bother her. Hands on table, she looked down with a deep sigh. "I'm sorry, it's ... uh ... I ... I shouldn't have asked that." "No ... It's all right ... I-"
"So much has been thrown at you in such a short time. Should have known better." "This is definitely going to take some getting used to," she replied slowly. "But," she looked up abruptly giving Duffy a slight start. "Like it as not ... I'm in it. Have to make the best of it. No sense giving up and ... 'dying' ... "
She looked past Duffy at no where in particular. "As if you could ... "
"And you'd only come back." "Does that really ... I mean ... Have you ...?" "No, not me. Dying once was enough. I'm not part of this little dispute of theirs and they seem to respect that." "Well then ... How did you ... "
"I think it was heart attack or something. Was taking in a movie I'd just gotten. Chest started hurting and the next thing I know ... I'm here. Quite a shocker when I looked out the window." "It was the same with me. I woke up and-"
"Hmmm," Duffy thought aloud. "You've been here ... how long so far?" "Almost two days counting today." "I think I would have seen you before now." "I was in my apartment, trying to sort things out when there was a knock on the door." "The Tachibana kid I take it?" "Yes. With no one to reach on the phone, I was desperate for some ... ANY information." "So we're talking ... At least I was mostly." "That Tachibana isn't much of a conversationalist to be sure." "No," Rachel replied, "no ... she's certainly not." "I took my time venturing out. It was almost one when I did. Stuck mostly to Admin ... Class Building B. That's where the Yusa girl found me. Brought me to that 'headquarters' of theirs. "So there ... " a long hesitation as she asked, " ... really IS a war of some kind ... going on ... happening ... here ... ?" 1. 8 Ball Bunny (Warner Brothers, 1950.) was a Bugs Bunny theatrical cartoon short directed by Chuck Jones. In it, Bugs, out of the goodness of his heart, helps out a voiceless show business penguin by taking him to the south pole in the belief the bird belongs there only to find he was born in captivity. Along the way, the two run into Humphrey Bogart several times who reprises his role from the film, The Treasure of the Sierra Madre (Warner Brothers, 1948. ), with a riff on his line about being a fellow American in need of help. The director/producer of the film, John Huston, played the "mark" to the begging Bogart. 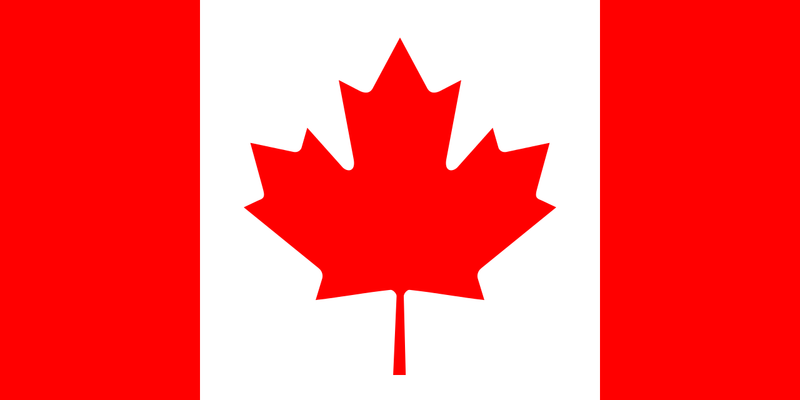 Canadian National Anthem, O Canada (instrumental) here. Canadian National Anthem, O Canada (English) here. Canadian National Anthem, O Canada (Francais) here. 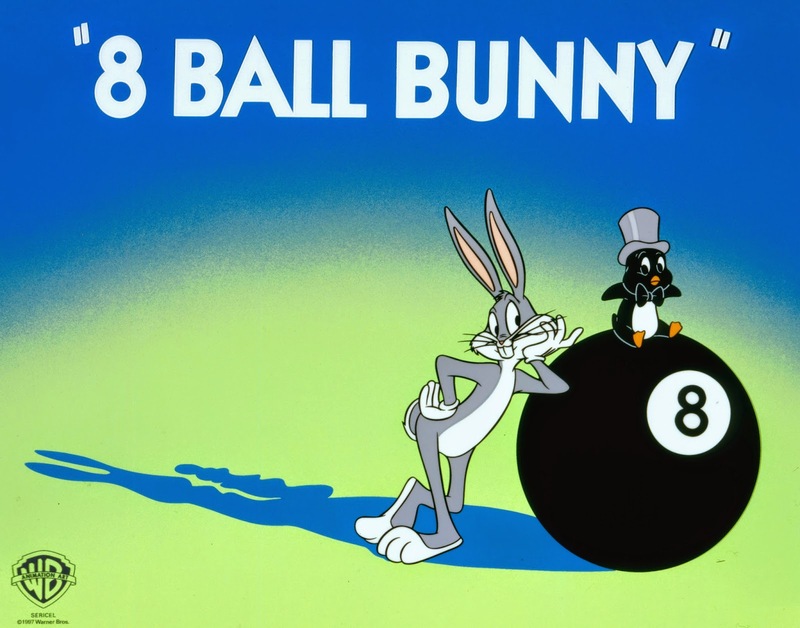 Wikipedia article on 8 Ball Bunny here. In Gods' Good Time chapters 1, 2, 3, 4, 5, 6, 7, 8, 9, 10, 11, 12, 13, 14, 15. Go to C V Fords' profile page and anime fanfiction stories list at fanfiction.net here. Go to Jays' Tee Vee blog main page here. If there are other articles below this one, yer already there ... er ... uh ... here .... YEAH! ... That's it! ... HERE!